Let’s answer the question, What are cats scared of? 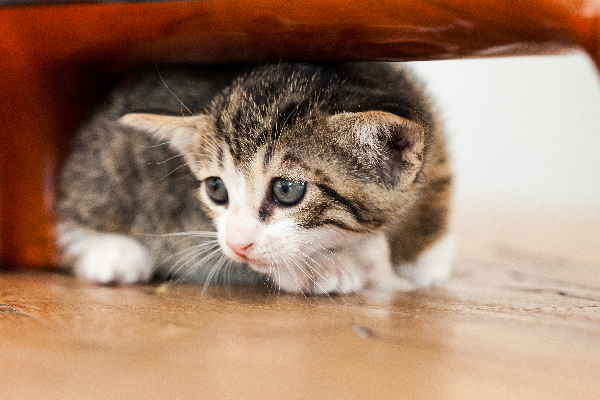 and figure out how to alleviate a cat's fears — from the seemingly silly (vacuums!) to the serious. Fraidy-cat and scaredy-cat are frequently used terms defined by Merriam Webster Dictionary as “someone who is very afraid of something” and “an unduly fearful person,” respectively. As a cat parent, I feel this is unjust — there’s no fraidy-dog or scaredy-hound in our lexicon. The irony is, my greatest household fears, like finding a spider or mouse, are calling cards for a rousing round of feline fun. But, when I touch the vacuum, my cats scatter like I would if I was ankle-deep in arachnids. So, what are cats scared of? And, more importantly, how can we help them overcome their fears? Let’s find out! Before answering “What are cats scared of?” let’s look at why cats get scared in the first place. A scared orange, ginger cat with his ears back. Photography ©MarynaVoronova | iStock / Getty Images Plus. From an evolutionary standpoint, a healthy amount of fear keeps the lineage going. Nathan L. Letts, PH.D., in a blog on Psychology Today, states that there is a basic fearful reflex ingrained in many animals at birth. And cats come with a lifesaving lion’s share of fearful triggers. 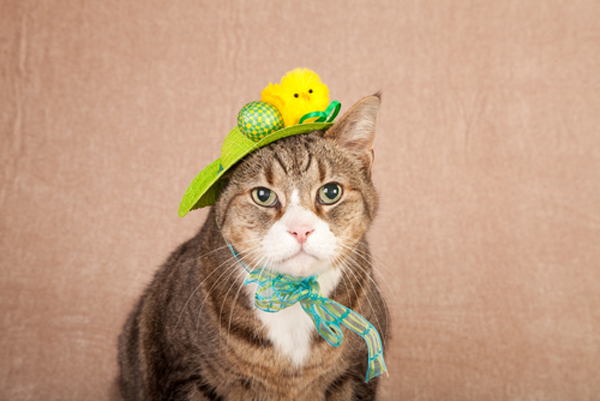 I recently had a conversation with an adopter of a shyer cat who had an “a-ha” moment. The new pet parent was getting the kitty acclimated to his home and keeping her in one room (as per expert advice). She was slowly becoming friendlier, but he removed the bed frame so she couldn’t hide. This minor difference was a major change for the kitty and set the cat back to day one. What are cats scared of? 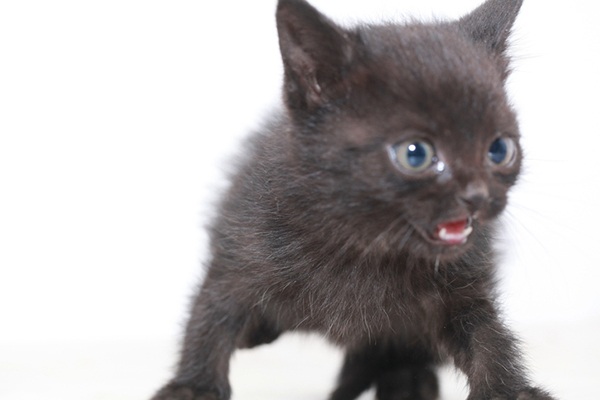 The top 6 things that frighten cats. Loud appliances like vacuums tend to frighten cats. Photography ©PeopleImages | DigitalVision / Getty. New people. Aka the vanishing cat of game night. New family members. Introducing your cat to a new cat, dog or baby, needs to take place slowly because the new dynamic is scary to them. Loud appliances. 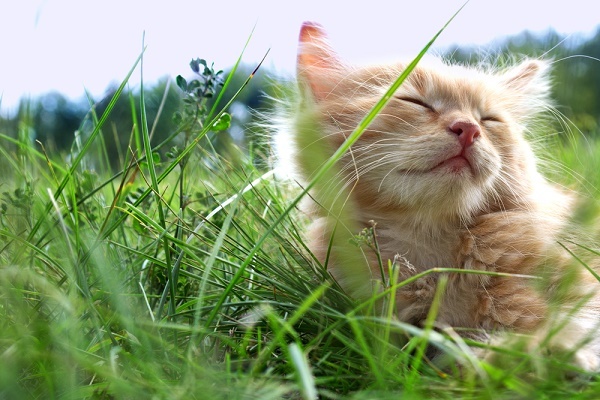 Household objects like vacuums, blenders, washers/dryers and blow-dryers can send cats scampering. Going to the veterinarian. Moving outside their familiar territory scares many cats. Moving to a new home. A mind-blowing experience that scares cats and many people. What you can do to alleviate what cats are scared of. You can help your cat overcome her fears! Photography ©OlegMalyshev | Thinkstock. It’s extremely important to be mindful of what you shouldn’t do! “One thing that many well-intentioned people do is try to ‘show’ the scared cat that the scary thing is okay,” says Dr. Delgado. “For example, if the cat is afraid of visitors, the guardian might drag the cat out of hiding when strangers come over to convince the cat that visitors are safe. This is called ‘flooding’ because the cat has no control over the exposure, and is considered very stressful!” Dr. Delgado emphasizes that this backfires and makes the situation much worse. However, for phobia-stricken cats, she recommends management and desensitization. Managing a cat who is scared of the vacuum or visitors is accommodated by setting the cat up in a safe room before the scary thing happens. Desensitization often goes hand-in-hand with counter conditioning (changing a negative response to a positive one). Basically, it’s exposing the cat to the “scary thing” at a level that doesn’t trigger a fearful response and rewarding the behavior. If your cat is scared of men, get a man to sit quietly with the cat and feed her tuna. Over time, he can move closer to her. Clicker training is a teaching technique that works well for scared cats. The best cure is always prevention: socialize, socialize, socialize your felines. Experts agree that helping your cat overcome things she is afraid of works best with patience and letting the cat set the pace. 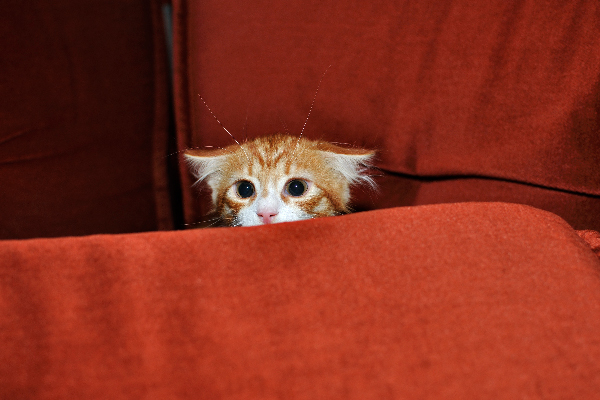 Tell us: What are your cats scared of? How do you help them overcome their fears? We inherited our outdoor cat and her brother from our daughter. For years she has loved the outdoors but now won’t go out-even with her big brother to protect her or one of us outside with her. Clearly a trauma has changed her behavior. Though she approaches the door and sometimes meows to get out, when the door is opened she won’t go. Is there a way to help her overcome her fear and enjoy being outside again? Well my cat is the opposite..too frightened to come inside??? My cat is a newly adopted stray. She is not shy at all but as it turns out, she has a bad tooth infection, and administering the antibiotics has been traumatic. I am able to do it twice a day, but she’s scared of me now. She has been so affectionate, so the change and the fact that she’s sick has me feeling gloomy. Can our relationship return to normal once we’re done with the medical treatment? I got Kate when she was a kitten. Every night she would jump on my bed to say goodnight then go to the end of the bed or find another place in my room to sleep. If my door was closed, she would claw and meow until I let her in. She would always want to be near me. When she would sneak outside, she would come in at dark especially for a treat. For the last three days she will not come into the house and when I go to get her she runs away. She sits on the deck railing but won’t come in. Tonight she didn’t come at all. How can I get her so I can help her? I found a stray cat near to my home. I’m worried to see it going on the streets and it might get hurt. So I managed to catch it and brought him back to my home yesterday. Maybe its two to three months old but its very scared of everything. It sits under my sofa and it never allows to touch him or it never comes out. He didn’t eat any food from last night. Can you please advise me what steps I need to take to make him feel comfortable. It is scared now, but he will surely eat eventually. Make sure it has plenty of water. Give space and let it roam and eventually it will start to trust and warm up to you. My cat hit my vacumm upstairs and it came on and scared him. now he will not come upstairs even though I moved it…How can I get him to come back upstairs? Pingback:Why Is My Cat Scared Of Everything? When we replaced our living room ceiling fan, my one kitty was terrified of it and took weeks to enter the room. After researching it, aparrently it’s a common fear. They feel like it could be a hawk. Who knew? I adopted two six month old kittens. The shelter said they were found inside a dumpster. With lots of patience they have come a long way already. Their safe room is my bedroom. I lost my seventeen year old cat in February. He was everything to me. I live in a big beautiful house with my husband. They have every cat toy, seven foot tree house, three story penthouse, all kinds of cat beds. They love their new home. The whole house is set up for kitty. They sleep with me, let me pat them. Everything is on their terms. My concerns are they still run away at times. Will I ever be able to pick them up? They need their regular trips to my vet. She is the medical director and went through everything with my cat Jason. He had kidney disease, thyroid disease, inflammatory bowel disease. I gave him his medicine and fluids. I took of from work to keep him well. I did everything known to man for him. Now you know my dedication, I need to give my new kittens their flee and tick prevention. They will never let me get close enough to handle them. I do not want to ruin all the progress we have made. I cannot get them into a carrier to bring to the vet. Any advice on what else I can do to get them to really trust me? I am desperate please help me. I have a 16 year old male Pixiebob that we purchased from a breeder as a 3 month old kitten. He has been terrified of everything and everyone since the day we got him. He is particularly afraid of people other than me. I am the only person that has ever been able to do anything with him. He even was terrified of my husband who never did anything to scare him. Nothing I have tried ever made any difference and I run a beauty salon in my home so it’s not like he never saw new people. He just hates them all!! He also has sprayed in the house his whole life and nothing I have tried fixed that either. That is just how he is and will always be. We have a semi stray cat who visits every day.We thought he (def a Tom!) was feral but we think he may have a home somewhere as he doesn’t always want food. He has been coming for 4+ yrs but will not let us get within 6 ft of him. We have an outside kennel on the porch with hot pads & blankets in so he can be safe & warm…he often uses this when the weather is at it’s worst…rather than going to his other home…which we think must be pretty rubbish. We have 3 other cats…the large male (neutered) will chase Scaredy cat off if he sees him too. Any idea how we can get closer to Scaredy in case he ever needs medical help? I helped with four feral kittens left here by sitting on the ground near them and dragging a broken branch across my lap. Soon they were running across my lap chasing the branch. They began to lose their fear and shyness. Not long after, they were following me in the yard. Soon they learned to live in the basement with a cat door. The joy boys of my life.